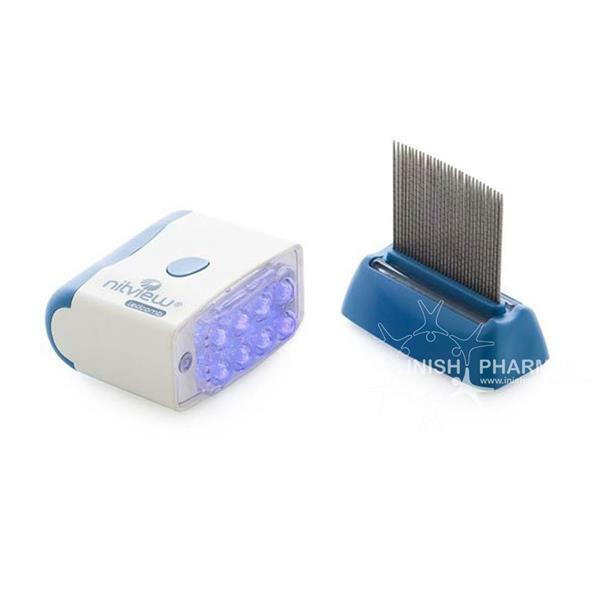 Nitview Ledcomb incorporates an ultraviolet light and detachable comb with micro-channelled teeth for the effective removal of both lice and nits. The lice, their eggs and nits (the empty egg cases) glow under the UV light making them very easy to find amongst the hairs and then remove with the comb. Is safe for use on both wet and dry hair. Does not rely on insecticide chemicals. Will not cause resistance to treatment. Will not cause allergy or irritation. Use of a Nitview Ledcomb, conditioner, a white or paper towel in low light conditions. This procedure will be required to be carried out every 3 to 4 days over a 2 week period. Wet hair and towel dry (Nitview Ledcomb can be used on wet or dry hair previously untangled). Comb with an ordinary comb to untangle hair and then divide into sections. Using the Nitview Ledcomb, carefully comb through each section of the hair approx. 2cm apart. Insert the teeth of the comb to the root of the hair and pull through to the ends. Clean the comb between each section and check for live lice. Repeat for the whole head. Wash off conditioner and repeat combing on the wet hair. If lice are found, repeat every 3 to 4 days for a period of at least 2 weeks until no live lice are found.. If no live lice are found, repeat the procedure weekly to prevent infestations. Check the whole family and inform social contacts. Nitview Ledcomb is an internationally patented medical device that incorporates an ultraviolet light (400-405nm, light range naturally visible to the human eye) and detachable comb with micro-channelled teeth for the effective removal of both lice and nits. The lice, their eggs and nits (the empty egg cases) glow under the UV light making them very easy to find amongst the hairs and then remove with the comb. UV light is absorbed by chitin, a major constituent of the 'shell' of lice and nits. Chitin emits fluorescence during exposure to UV which makes the insects glow. The comb section can be easily removed to enable the UV light to confirm that all lice and eggs have been removed and help to avoid the recurrence of the infestation. The light can be used to check clothing, towels, bed linen etc.